The Maryland Healthy Working Families Act became effective as of February 11, 2018. Many employers continue to have questions regarding the Act’s requirement for employers to provide employees with ESS time (earned sick and safe leave) to care for themselves or their family members, in accordance withthe requirements of the Act. Consulting with a Maryland business attorney can help ensure you are complying with all provisions of the Act. Below are several of the important provisions of the Act that employers need to understand and take steps to ensure procedures are in place to complywith the new law. Correctly calculating the number of employees can be very important for some employers. An employer is required to provide unpaid ESS if the employer has fewer than 15 employees, although the employer can choose to provide paid ESS. Paid ESS must be provided to employees if the employer has 15 or more employees. The number of employees is calculatedby using the average number of employees employed by the employer in Maryland during the past 12 months. However, it is crucial to understand that “employees” include both full and part-time employees as well as temporary and seasonal employees. Employers may choose to allow employees to accrue ESS gradually with every 30 hours of work. However, the employer may choose to provide access to the full number of ESS hours the employee is expected to earn during the upcoming 12 months at the beginning of the year. If an employer chooses the accrual method, employees earn one ESS hour for every 30 hours worked up to the maximum of 40 hours per year. When an employer chooses the accrual method, the employee is allowed to carry over up to 40 hours of ESS each year. However, employers who provide the full 40 hours (or the anticipated number of hours an employee is expected to earn that year) at the beginning of the year, the employer is not required to allow employees to carry over ESS hours to the next year. · Some real estate salespersons and brokers. It is important to review the requirements for exemptions with a Maryland business attorney to ensure you are not excluding employees who are covered by the Act. The Act allows employees to use ESS time to care for family members. Family members are definedas an employee’s spouse, parent, grandparent, sibling, child, or grandchild. The Act specifies when employees may use ESS time. Some of the approved uses for ESS time include paternity and maternity leave; mental or physical illness; injuries; preventive medical care; and, some absences due to sexual assault, domestic violence, or stalking. Employers must be very careful and ensure they have policies in place that allow for ESS time when the Act covers the request for leave. Do You Need a Maryland Business Attorney? 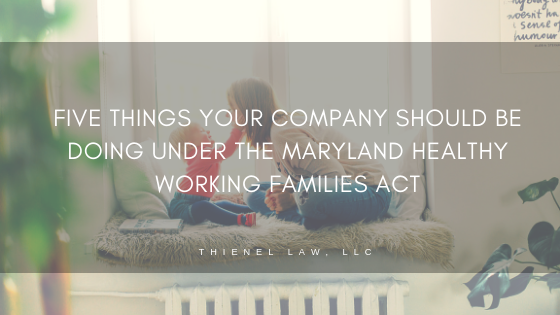 If you have questions about the Maryland Healthy Working Families Act or you have not instituted policies and procedures to guarantee compliance with the Act, contact Thienel Law today. Fines and penalties for violations of the Act could be substantial, including payment of up to three times the amount of the employee’s wage for noncompliance. Maryland business attorney Steve Thienel is dedicated to assisting clients in Maryland, Virginia, and throughout the DC Metro area. Newer PostMaryland’s Minimum Wage Increase - Is Your Company Compliant?